Well into the fourth and final week of its annual session, the Special Committee on Peacekeeping Operations–better known as C-34–has hardly started negotiations on the text of the report it is expected to adopt by Friday, March 15. However, there is reason to argue that this slow start is not necessarily bad news for the Committee and, more broadly, for those who believe that the UN General Assembly is capable and willing to provide political guidance to the some 100,000 peacekeepers currently at work around the world. Missing the deadline has recently become a habit for the C-34, whose yearly report, due for March, has been adopted in May in 2011 and in September last year, so no one would be shocked if this year’s agreement would be reached in the extra time. More important, the apparent reason for the current delay lies not in major disagreements within the membership on substantive issues, but rather on the modalities to implement much needed reform in the Committee working methods, including the final format of the annual report. There is agreement on reforming C-34 working methods, and encouraging steps have been already agreed upon. Finding a compromise on outstanding issues is perfectly feasible, since there are only small differences between the positions. Should procedural issues prove harder to be solved than expected, committee members should consider moving forward on the substance of the report, where consensus exists on the majority of the text and divergences are limited, in order not to waste time and political momentum. At the end of the day, the C-34 is the only UN body charged with comprehensive review and guidance of UN peacekeeping operations, one of the most prominent and challenging of the many functions carried on by the universal body. Repeated delays in the C-34’s work, and failure to implement gradual but vital changes, might undermine its role and legitimacy, while successful reform can send a powerful signal on the organization’s capability to reform itself. The C-34 was established in 1965 with a mandate to conduct a comprehensive review of all aspects of peacekeeping operations, but in fact it was devised to tackle the financial crisis generated by the refusal by some member states to pay their share for the recently completed operation in the Congo. In 1989, its annual report was less than one page long; in 2012, it reached a record size of 64 pages, divided in 274 paragraphs. 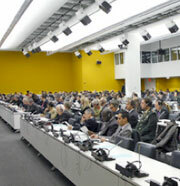 No doubt peacekeeping has grown in size and complexity over the last twenty-five years; however, the length of the report reflects also a current pathology in multilateral periodic deliberations; a type of inertia where new issues are quickly taken on board, while topics which are no longer relevant survive indefinitely. Considering also the delicate balance of a text where each of its 26,000 words is tied to the rest (according to the well-known UN formula “nothing is agreed until everything is agreed”), it is easy to understand why each year the text grows longer, to the point of losing the sense of priority and effectiveness. Committee members have been aware for some time of the need to reverse this trend, as well as to address other inefficiencies in the C-34, and have attempted in recent years efforts to enhance its working methods. Two years ago, as part of these efforts, the International Peace Institute was asked to lead a consultation process with members of the C-34, ultimately producing an options paper presented to the C-34 and the UN Secretariat in December 2011. It contained 10 options for reforming C-34 working methods, mostly based on committee members’ views and proposals. – To separate, within each section of the report, non-operative paragraphs from requests and recommendations, while clearly identifying the actors to which requests and recommendations are aimed. Although there was not enough time in 2012 to implement the agreed on reforms, the first three decisions have been applied in the preparation of the first draft for 2013, which, as a consequence, contains 43 “standardized” paragraphs, and don’t need to be negotiated this year. In turn, this has helped to reduce the number of the working groups from eight to five. Finally, while the draft report is not fully streamlined, each paragraph clearly identifies any requests for changes compared to the 2012 text. Where agreement on implementation has not materialized yet is on the fourth decision, since different views have emerged on how and when to separate the non-operative part of the text from operational requests. From an outsider’s point of view, the significance of this dispute could be hard to see, since the decision seems to have only one and hardly disputable objective: to clearly identify which kind of follow-up the report is asking for, and who is expected to provide it. However, different ways of rearranging the text might have broader implications which go beyond that immediate objective. In the end, one might argue, readers might pay attention only to the operational requests, while all the principled and politically significant paragraphs would lose relevance. This would undeniably represent a mistake. The C-34 report is much more than a list of practical requests to the Secretariat for Powerpoint presentations or translations of documents in the six UN official languages. Once endorsed by the General Assembly, it becomes a crucial component of the articulated process which provides the peacekeepers with the highest possible form of legitimacy and collective support, complementing the mandate provided by the Security Council to each individual operation and the financial backing granted by the Fifth Committee of the General Assembly when it endorses their annual budget. There is very little time left to make the March 15 deadline, and while a few days or weeks delay would not represent a catastrophe, committee members should be aware of the symbolic value of their next steps. Well beyond the impact of the limited reform they are committed to implement, in fact, from their failure or their success observers will be drawing conclusions on the capacity of the UN system to reform itself, which is so often invoked and has so far rarely materialized. Alberto Cutillo is a Visiting Senior Fellow at the International Peace Institute.